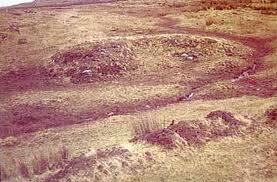 Clare Island was occupied long before the O’Malleys, which becomes evidenced by the 53 mysterious Bronze Age mounds. Four of these “fulachtaí fia” four have been excavated. Unearthed from the mounds were piles of heat shattered stones and wattle troughs. Two were radiocarbon dated to 2,000 B.C. and two to around 1,000 B.C., so whatever they were used for continued for a millennium. This unfortunately doesn’t give any information about population numbers, but it shows that there had been a continuous settlement on the island for centuries and that the fluachtaí fias continued to be used over a long period of time. These fluchtaí fias probably had a wide range of uses, among them heating water. That these mounds were used for sauna bathing is another theory. Another possibility is that they were used in passage rites, marriage or linked to religious observance. Promontory forts can also be found on the island as well as a number of enclosures and a megalithic tomb. This tomb dates from 4,000 to 3,000 B.C. and is a court tomb, the earliest type of megalithic tomb in Ireland. This megalithic tomb had a roofless forecourt and a compartmentalised burial chamber. Ritual practices were performed in the forecourt. The tomb acted as a ceremonial centre for the community. The presence of the tomb suggests that the island had a settled farming community as early as 4th century B.C. There are no archaeological monuments dated between 3,000 and 2,100 B.C., however, and archaeologists are unsure whether the island was continuously inhabited during that time. There are also few remains from the first millennium and early Christian period, but a standing stone and holy well close by the Abbey suggests it was a place of worship before medieval times. The island’s promontory forts are not as ancient as we might like to imagine and date from around 1400 to 1500. Recent excavations failed to uncover their social roles so one can only assume the forts were built on promontories for reasons of status.